And what could be more simple than white dishes? White dishes don't complicate anything. and they don't act like a diva and ask to be the center of attention. white dishes are simply gorgeous. in white pitchers just because. which brings in another element and a pop of pretty. One of the best things about white dishes on display? So easy to change the look for the seasons. For fall, bring in a bit of warmth with copper or gold and a bit of greenery. 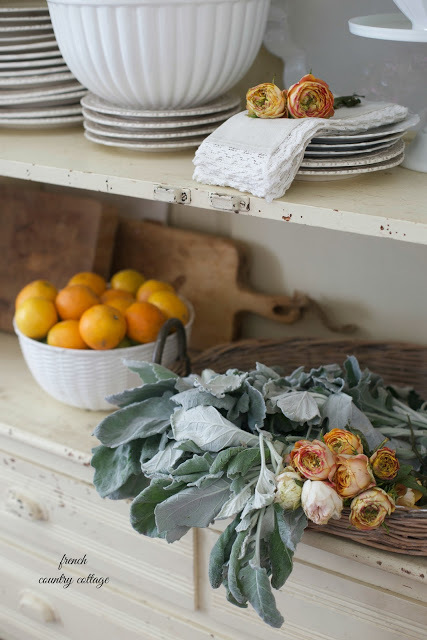 Dried blooms, fresh blooms, any and all kinds. 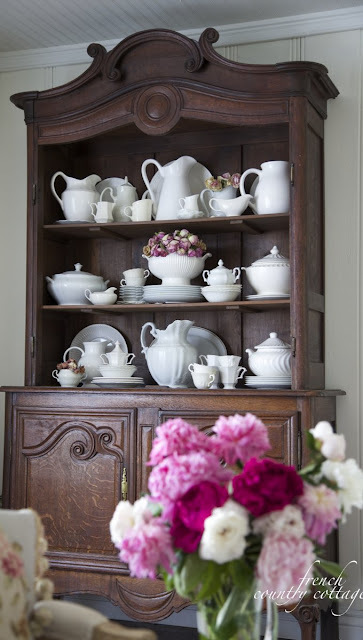 This styling uses a tureen and sugar container filled with dried roses. Simple and easy and adds just the right touch of summer. Yes, this is a holiday photo. And yes, I know it is July. Please do not throw eggs at me. or potted plants in a tureen to take those dishes from summer to holiday in a snap. and how I took the doors off two of the cupboards to create those open shelf areas? 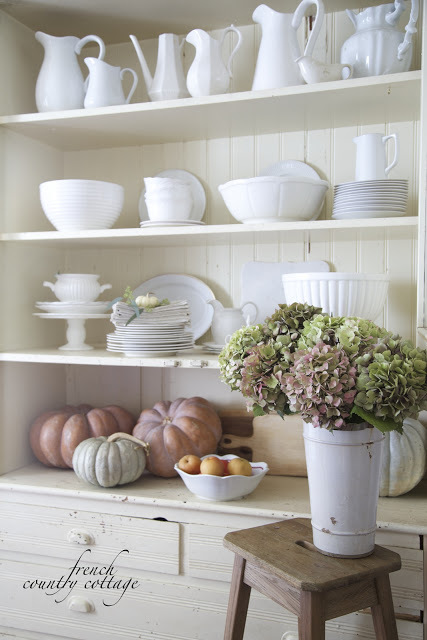 Well, those shelves are perfect places for a few white dishes. 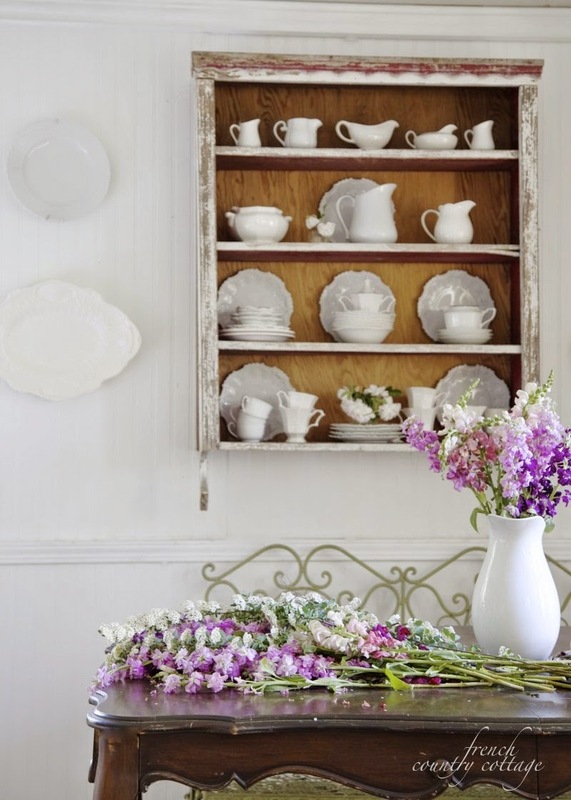 coffee mugs, platters or whatever you need to store in a pretty way. Simple and sweet and full of vintage charm- yes, please. and went right up on the wall in the cottage. So simple really is as simple does. Styling shelves or display areas doesn't need to be complicated. 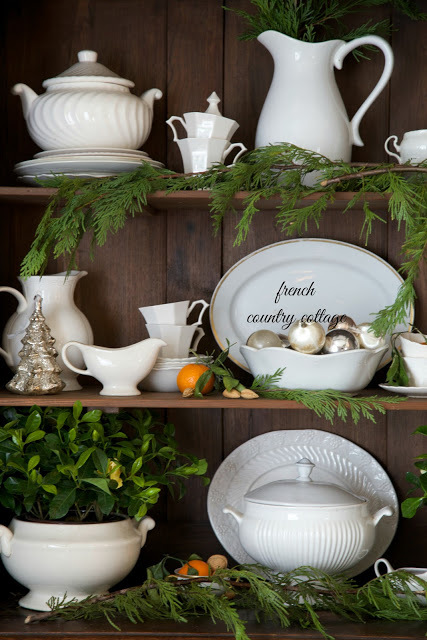 Keep it simple and let those collections of white dishes, platters, pitchers and everything in between shine- and sprinkle them with seasonal touches for a quick refresh. I love how you style your cupboards:). I hope to see a few photographs in your book, simply beautiful! 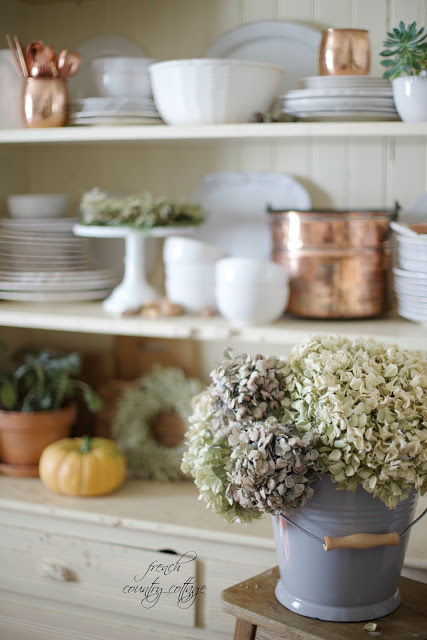 My favorite is the copper and Autumn display in your kitchen cupboard:). I think decorating with white dishes is sooo calming, so ethereal. Just perfect when you want "pretty" but not "busy." And, Christmas in July? Always room for Christmas celebrating, any time of year! I love white dishes! I collect milk glass and I find it is always classic, goes with everything, and really does make a simple statement. White dishes are sort of the equivalent of a great white blouse that looks perfect with everything. Have a great Wednesday Courtney. After spending my youth going through many different patterns and colors of dishes and serveware, I finally figured out that all white makes the most sense economically and with regard to design versatility. Something breaks, replace it with something similar. So easy and fuss free. Glad I finally wised up! Your photos are great by the way. Great post! Beautiful!!! I love white dishes too and you have them styled so nice. Thanks for sharing. I have all glass uppers in my kitchen (which many people tried to talk me out of and thank goodness I didn't listen) and white dishes are my favorite to have in them. Classic and always looks great, even if I don't have them perfectly situated. I do the same---white or creamy white dishes, pitchers, etc. with the occasional greenery or flowers in my display shelves. Instead of copper I use aged brass because I have a few beautiful pieces that were given to us as gifts. Love all the white pitchers and styling tips!!! 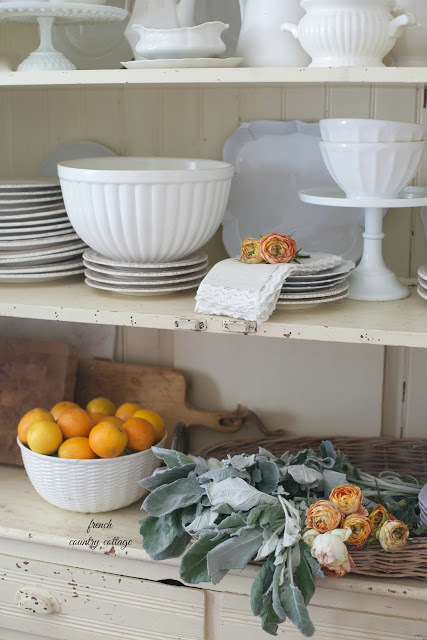 Love all the white dishes, and styling tips..
Beautiful photos. I covet your collection of white china!